Most of the classrooms at Parker University have huge windows on either two or three sides. This allows for some spectacular views, especially on the second floor classrooms. It is nice to be able to look outside and catch a glimpse of nature in between lectures. In one case, this spectacular view taught me an invaluable life lesson. This is the story of a bird named Dipshit. The sun had just peaked over the eastern horizon, which caused a warm influx of sunlight into our classroom. I was enjoying the warmth of it while listening to the professor lecture that morning. Suddenly I heard a tapping very close to me. 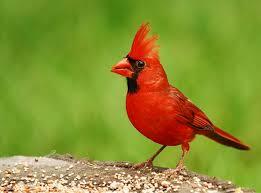 I looked over and there was a male cardinal, a brilliant red color, tapping on the classroom window with his beak. I quickly surmised that the sunlight had caused a reflection, and this beautiful bird had confused his mirror image for a competitor infringing on his territory. He continued to attack the glass, knocking his beak into his perceived enemy. After the lecture a few of us gathered and laughed at the silly little bird. One student exclaimed, “What a dipshit!” And so the bird was named. That afternoon I went to my truck, and whom did I see but Dipshit. He was attacking his reflection again, this time in the window of the car next to me. He looked a little worn down and his feathers were ruffled. I wondered if he had spent his entire day knocking his head against windows, attacking his imaginary enemies. I let out a big sigh as I looked around; it was such a gorgeous spring day! What a shame that Dipshit was so concerned about this perceived threat. The days became weeks, the weeks became months, and the semester was coming to an end. Dipshit continued to guard his territory ferociously, attacking his reflection repeatedly and without regard for his own health and wellbeing. He had a particular inclination to show up in the middle of an exam-as if Pathology was not difficult enough! He began to look worse and worse as the end of the semester approached. He had lost weight and his feathers were now ruffled and mangled permanently. I felt sorry for the bird and thought to tape pieces of white paper up on all of the windows in our classroom, but then again, I couldn’t go around taping pieces of paper on every car window too! The best I could do was to hope Dipshit would eventually realize that he was attacking himself. Then it came to me, like a tiny lightning bolt between my ears-I was Dipshit. I had been Dipshit my entire life. How many times had I “attacked my reflection”, in other words, how many times had I gotten upset over something that I could have let go? You see, in an instant I came to understand that EVERY PROBLEM I HAD EVER HAD IN MY LIFE I HAD CREATED MYSELF. I am going to repeat that statement because it changed my life and I have a feeling that it could change yours as well. Every problem I have ever had I created myself. In every instance, in every argument, in every situation I CHOSE HOW TO REACT. You may be thinking, what the hell is this guy talking about? Let me explain. Every encounter with another person is a reflection of you. For example, let’s say someone cuts you off on the highway. You immediately honk your horn and throw up your hands while yelling, “YOU’RE A FREAKING MORON!! !” Your sympathetic nervous system turns on, your adrenaline levels go through the roof, and your stress level skyrockets along with it. You might be thinking, hey, the other guy cut me off, it wasn’t my fault! But wasn’t it? Didn’t you CHOOSE to get angry, yell, and honk your horn? Didn’t you just attack your own reflection? What did any of that yelling and honking achieve? What about the last argument you had with your spouse. Was the issue really important? Were you arguing over money? Was it so important that you are still mad about it today? I would imagine not. In reality there was probably something YOU could have done better when discussing it with your sweetheart. Isn’t it always true that we can improve how we deliver our message to the ones we love? You see, by not taking care to guard the emotions of your loved ones, you have been attacking your own reflection all along. I think about Dipshit often, especially when I am involved in some kind of argument or facing a difficult decision. What a magnificent creature he was meant to be. Can you imagine being a bird, with the ability to fly high above the city and swoop down into stream for a drink and a quick bath? What a beautiful opportunity that Dipshit wasted every day. He was not living like a bird anymore, but more like a man. Jealousy, anger, fear, and greed had consumed his being to the point of his detriment. How many of us are attacking our own reflections? How many of us are allowing our health to decline over issues that don’t really even exist? How many of us are missing beautiful days, these moments that will never be recaptured, over things that are as silly as money? As I continue down the path of self-improvement I strive not to be a Dipshit. In every encounter I now walk away wondering what I could have done better. Even if I know the other person was 100% wrong, I still walk away thinking HOW COULD I HAVE DONE BETTER? Could I have been more kind, more understanding, could I have been a better listener? Could I have been more patient, more sympathetic, could I have interjected my opinion at a better point in the conversation? My communication with others has improved markedly since I adopted this new mindset, and I would encourage you to consider doing the same. Good luck on your journey and remember-every day is a gift!